Bring salted water to a boil, then add the sliced green beans and cook uncovered for 2 to 3 minutes until al dente. Strain beans and set aside. Combine the soy sauce, chicken broth, sugar and salt and mix well. Heat the peanut oil over high heat in a large heavy skillet until hot but not smoking. Add the peanuts and fry, stirring constantly, for about 20 seconds (careful, they brown faster than it seems!). Add the garlic, stir, add the chiles de árbol, stir, add the scallions and stir. 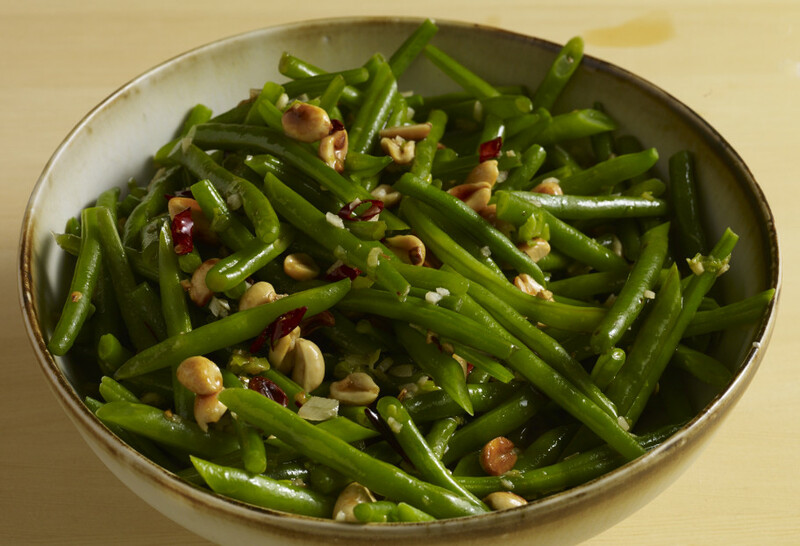 Add the green beans to skillet and mix to combine all the ingredients, and finally pour in soy sauce mixture. Let it all cook for 3 to 4 minutes. Serve immediately or turn off the heat and cover to keep warm. Plan on making this dish for Thanksgiving! Can I make one day in advance & reheat? I have been thinking about this recipe since I saw you make it on your show. So tonight I made it…AMAZING!!! This is so delicious I have to share it with everyone I know. I threw in some fresh asparagus with the beans, and I am so happy with the results. I am not much of a t.v. watcher, but I never miss your show. I love it! Thank you for tuning in, Tracey! And I have to say, the addition of asparagus sounds wonderful. Pati, my daughter, for her Culinary Arts class, made this for our family. In Montana, we only have Chile de Arbol dried. It was really good and full of flavor. I love your show and thank you for sharing your Mexican recipes! Thank you for your message, Paula! I’m so happy your daughter picked this recipe to make!! I use dried chile de arbol when I make it, too.